The Russian Foreign Ministry has confirmed that Moscow is hosting a trilateral meeting of the Foreign Ministers of Russia, Armenia and Azerbaijan on the Nagorno Karabakh settlement on April 15. Russian Foreign Minister Sergey Lavrov, as well as Azerbaijani Foreign Minister (Elmar Mammadyarov) and Armenian Foreign Minister (Zohrab Mnatsakanyan) will hold a meeting in Moscow on April 15, it will be devoted to issues concerning the Nagorno Karabakh settlement," the official representative of the Russian Foreign Ministry Maria Zakharova told a briefing, according to RIA Novosti. She added that the OSCE Minsk Group co-chairs from Russia, the United States and France will take part in the meeting. 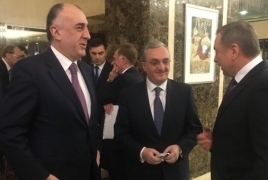 On 29 March, Armenian Prime Minister Nikol Pashinyan and Azerbaijani President Ilham Aliyev held in Vienna their first meeting under the auspices of the cօ-chairs of the Organisation for Security and Cooperation in Europe (OSCE) Minsk Group.